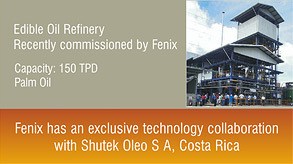 Shutek Oleo S A, Costa Rica. Our objective is to provide the best Engineering Services, Reliable Equipments and Complete process lines to our customers in the field of Edible oil refining (Chemical & Physical), Oil Pre Treatment for Bio Diesel, Bio Diesel Production , Methanol Recovery, Glycerine Purification, Fat Modification, Bio Ethanol, Ethanol De-Hydration and Distillation plants. Experience of having executed many vegetable oil refining plants. Has the process engineering and project handling capability. Has the in house process simulation & design softwares and AUTOCACAD facilities. Has exported plants and systems out of India. Has own manufacturing facility for core components like structured packing, column internals, heat exchangers, reactors, as well as fabrication of all process equipment. Process to remove phosphatides from seed oils by precipitation with water and centrifugation - a method commonly used for seed oils. Process to remove phosphatides from low grade oils containing non hydratable phosphatides by acid treatment, precipitation with water and centrifugation. Process of removal of gums and other impurities via precipitation and centrifugal separation, applied for physical refining of oils. Removal of free fatty acids, gums by centrifugal separation, after reaction with caustic lye, followed by water washing and separation of residual soap. Dewaxing by in situ crystallization and centrifugal separation of the crystallized waxes along with soap stock. Removal of colour pigments, oxidized components and residual gums via absorption in bleaching clay followed by filtration of the spent earth. Removal of substantial quantities of free fatty acids during physical refining along with volatile impurities also results in deodorization especially for high FFA Rice Bran Oil or Crude Palm Oil. Removal of residual free fatty acids and other volatile impurities by steam distillation under high vacuum. Generating high and low melting fractions from one feedstock via controlled cooling and crystallization, followed by filtration using membrane filters - process applied for RBD Palm Oil. Highly energy efficient system for production of Vanaspati or Hydrogenated fat. Process to modify the fat structure using Sodium Methoxide catalyst to produce bakery shortenings. Drying of wet gums recovered from water degumming of soya oil. Splitting of soap stock from neutralization, to recover crude fatty acids (acid oil) via reaction with mineral acid, followed by settling and separation.